"A delightfully fresh, crisp ending to a meal or after a fish course to cleanse the palate. Garnish with small mint leaves or any small green herb leaf." Use a vegetable peeler or large zester to remove 3 long strips of peel (just the zest, not the pith) from the grapefruits. Set aside. Squeeze out 2 cups of grapefruit juice. In a saucepan, combine the grapefruit peel, sugar, corn syrup and water. Bring to a boil, stirring to dissolve the sugar, and cook for about 2 minutes. Set aside to cool. Place in the refrigerator, or set in a bowl of ice for faster chilling. Discard the peel. If you do not have an ice cream maker, pour into 9-inch square metal baking pan; cover and freeze, stirring occasionally, until partially frozen, about 4 hours. 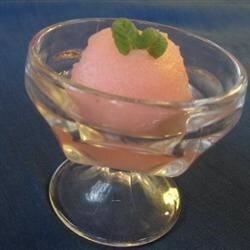 In food processor with knife blade attached, process sorbet until smooth but still frozen. Very delicious! It tastes exactly like the best pink grapefruit you ever had only better! I made it with 1/2 sugar and 1/2 Splenda to cut down on the calories and no one could tell. This is great- a good mix between tart and sweet. I like it better when it sets up and is a little hard.